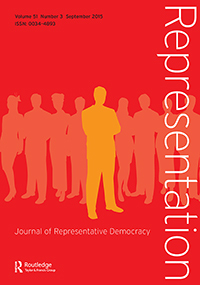 New article: "Provincial dynamics in the 2017 national elections in Ecuador", Democracias, 2017, vol. 5, pp. 3-24. Call for papers - Conference on "West-European Politics in 2017"
"Beyond the Water’s Edge: How Political Parties Influence Foreign Policy Formulation in Belgium", by Jeroen Joly, Régis Dandoy. "The new Belgian Senate. A (dis)continued evolution of federalism in Belgium? ", by Dandoy Régis, Dodeigne Jérémy, Reuchamps Min, Vandeleene Audrey.